Organized by RAW ART Singapore, The juried exhibition Raw Art – Undiscovered will be presenting twenty upcoming artists who are based in Singapore. Eclectic art pieces: painting, sculpture, prints and installations will be displayed for sale for 2 days only on the weekend of 17th and 18th July at the Sculpture Square. 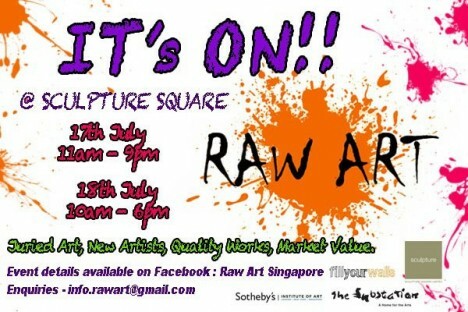 In this exhibition, Raw Art Singapore will give access to high quality of new art with affordable price. Sotheby’s Institute is also sponsoring The Passionate Collector – A panel discussion, which will be held on 18th July at 5pm. Presented by RAW ART and Meltvault, this session will be moderated by Art Historian and critic Gillian Nelson. The panelists Saskia Joosse of Pop and Contemporary Fine Art (gallery), Pwee Keng Hock of Utterly Art (gallery), Jean Tsai and Clifford Mallory who collect young contemporary Southeast Asian art will discuss issues concerning the new collector/ young art buyer. The supporting program for the weekend-exhibition includes guided tours and an on-site graffiti-performance by artist Dem on Sat, 17th July, 4pm. This art work will be auctioned off at the Sunday Fine Art Auction at 6pm.